If you have problems with pharmaceutical drugs or simply opted to stick with natural medicine, here is your chance to stock up your medicinal chest. 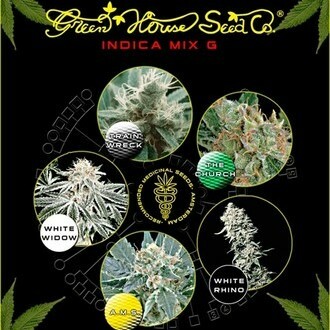 Greenhouse Seeds selected five Indica strains and all are well-suited for treating pain, inner unrest and tension. The mix contains A.M.S., The Church, Trainwreck, White Rhino and White Widow. Available in packs of 5 and 10 seeds. Many people have problems with pharmaceutical drugs or decided to stick with natural medicine, so the best idea is to grow your own natural remedy to stock up the medicinal chest. 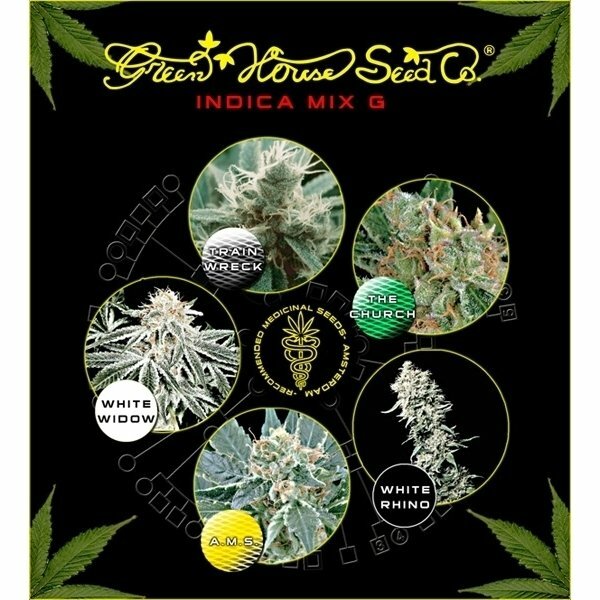 Greenhouse Seeds carefully selected five Indica strains for their medical qualities and came up with this mix of Indica strains. All of them are well-suited for treating pain, inner unrest, tension and lack of appetite. A.M.S. is the abbreviation for Anti Mold Strain - this is a nicely balanced hybrid with a very good resistance to mold. The parents of A.M.S. are a Swiss Sativa and a Swiss Indica from the Ticino region. When the plants have reached full matureness, they exude a pleasant fruity and citrusy aroma - and the smell gets even better when the buds are cured. The end product of A.M.S. contains 15% THC and over 1% CBD - and it is the high CBD level, that makes her so appealing for medicinal users. Also interesting, is the relatively high CBN level of 0.7%, both the CBD and CBN make the high a very calm and relaxed and not too heady experience. The Church is a genetic composition comprised of Northern Lights, Super Skunk and a Swiss Indica/Sativa hybrid named "Erdbeer" (German for strawberry). If you bring her up in a grow-room she will require 8 weeks of flowering to produce a yield of up to 800g/m². The other side of the coin is the potency - and The Church with its THC level of 20% is truly worth a sermon. The Church is a great choice for a funny gathering with your fellow potheads or as a remedy to battle anxiety or depression - the high feels very social and inspiration and motivation are off the hook. Be cautious - the more you smoke, the closer you get to a trippy feeling. Train Wreck is a very valuable medical variety boasting with a multitude of benefits - this is the strain of choice for patients suffering from insomnia, depression, anxiety, lack of appetite, cramps, nausea, muscle aches, pain and tension. You will be very pleased by the high potency and effectiveness of the weed. She is a perfect candidate for the ScrOG method with the potential to produce yields in the range of 600-700g/m² within 9 weeks of flowering. And Train Wreck is far from being miserly when it comes to cannabinoids, the properly cured end product contains 21% THC, about 0.7% CBD and 0.1% CBN. The high is stimulating and creative, but soon turns into an intense and very stoned feeling. White Rhino is a short, sturdy, round and bushy plant with strong branches - the typical stature of an Indica dominated strain. Although she is a rather small plant, she has the potential to achieve yields of up to 900g/m² within 9 weeks of flowering in an indoor setup, outdoors it is possible to yield up to 1.2kg per plant. The smoke of the buds has a sweet and fruity taste. 20% THC and roughly 0.1% CBD make the high a relaxing, very creative and social experience, but smoking too much will slow you down and drag you into a slumberous state. This pachyderm is a good choice for the late evening or nighttime, when you want to call it a day. White Widow is without a doubt one of the most legendary cannabis strains of all times - and there are good reasons for her reputation. Her genetic blend consists of South Indian and Brazilian and she is famed for her extreme resin production and her high potency. White Widow shows the growth structure and look of an Indica, but the duration of her flowering period is slightly longer - it takes her 8-10 weeks to reach full matureness. She performs especially well in hydroponic systems and can produce yields of up to 800g/m² - and with a THC level of 18% you know it is great weed. The very relaxing high comes on almost instantly and lasts for a long time.